A bombshell report from the government of Puerto Rico has revealed that, by April 2017, the island will be worse than bankrupt – it will have a deficit of $68 billion, a “debt” of $72 billion, and a complete inability to meet its pension payments. The 300-page report was submitted to the Financial Control Board (FCB) and was immediately reported in the island’s press. The report also states that all retiree medical plans may be suspended, and for the same reason…the absolute lack of funds. 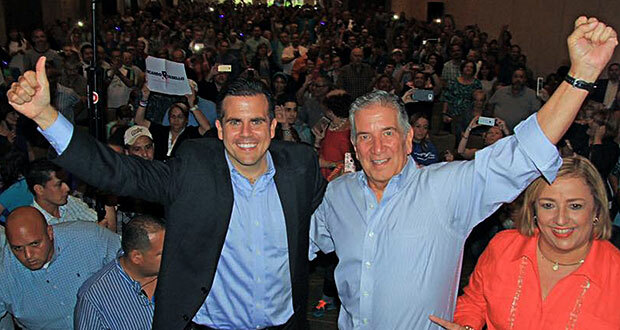 Governor-elect Ricky Roselló announced that he will “protect the public pension system” by installing “public private partnerships” (P3s) throughout his government, that will spin off some immediate funds. This “P3” expedient is precisely the one which the Financial Control Board has been pushing for the past few months. Unfortunately, the short-term relief from these P3s will carry a long-term-cost…the privatization of the island’s public infrastructure. In the long run this “privatization” will mean higher costs, and fewer jobs, for the island as a whole. In effect, Gov. Roselló is planning to mortgage the island’s future, and lease it to US banks, as a quick fix to make himself look good. This “kick the can down the road” approach is precisely the one that cracked – and ultimately crashed – the island’s economy. Yet here comes a new smiling governor, doing the same thing again. Not one word from this new “governor,” about removing the Jones Act from Puerto Rico. Not one word about tax incentives for Puerto Rican small businesses, rather than for US billionaires. This is what Puerto Rico elected into the governor’s mansion. This is a band aid ,a quick fix. he is selling his soul ,his country for pennies to the dollar. Puerto Rico needs its own commerce, own corporations , infrastructure,our own economy . Enough of this dependency on others for our own subsistence. See were it has gotten us. Stop been suckers ,cut the umbilical cord and free yourselves form this slavery. The same tired old crap and excuses, year after year, from politicians of both parties. The same politicians who got Puerto Rico in the situation that it’s in. What Puerto Rico needs is to elect an outsider, not a career politician. Now they claim they will not be able to continue paying teachers and other pensions to people who worked 25-30 years and contributed their share in good faith. What are these people supposed to live on? Now they say their health insurance coverages will also cease. How are these people supposed to get medical care and treatment? The politicians have no answers except to smile for the cameras and blame each other. They are financially secure. An estimated 50,000 people per year are abandoning the island. The quality and cost of living under these conditions is untenable. Most of those who stay do so because they can’t afford to leave. They are stuck in a welfare state that resembles a third world country more and more each day. I. It’s not the case of removing the Jones Act from Puerto Rico. The answer is to remove himself and all rhe other Vende Patria installed by Uncle Republican Sam from Puerto Rico. The wrong people have been driven out, into the States. Now GREED and Ignorant politicians are stealing even the only hope of the uninflected Educators by sucking dry even these very teachers’ tiny pensions. 2. “When the night is far spent, the day is at hand”. We’re ready for a quiet moral revolution. So, the –boss– of the Island — is planning to — LEASE IT TO –US BILLIONAIRE BANKS,— ( SELL IT ) TO MAKE HIMSELF LOOK GOOD. WHAT A CLOWN. Now the teachers that work so hard, for years, might not even get their PENSION ? WHAT A DISGRACED !!! AND WHAT HAPPENED TO —HIS STUPID PIPE DREAM ?—- I FEEL SO SORRY FOR — MY BORICUA BROTHERS AND SISTERS,AND MY FAMILY , THAT ARE LIVING IN MY —-PUERTO RICO. 😥 AN ISLAND —BETRAYED BY THOSE IN GOVERNMENT FOR THOUSANDS OF YEARS. —–AN ISLAND, VIOLATED, HUMILIATED, RAPED, AND NOW –POSSIBLY IN THE FUTURE, EVEN SOLD TO THE HIGHEST BIDDER . WHAT A 😥 😥 – ——-SHAME, GREED IS HELL..
to you puerto ricans that sold your souls to the devil are being punished by Yeshua for betraying him & begging the white devil for help instead of asking for his help.now you are feeling the heat of the devil.the white man who stoled all of your goods ,culture ,& now there coming for your souls with evil methods.churches ,are making you fall right in the devils hand.we must unite to take our land back or we will be inslaved without no rights.you weak dummys will suffer you will be homeless .jobless,& your children wI’ll starve to death for following the evil white race.the clock is tickin on the wicked.please free your selfs from the evil white race.you softies are scared ,paranoid,feeling hopeless,& with no plan.the white devil’s agenda is to destroy the black & brown dna by giving you diseases & destroying you mental & your way of thinking.my advice to you softies is this Repent or Die! !peace to all in the name of Yeshua.by the way stop celebrating .christmas .it has nothing to do with Christ you dumnys.